The DV4200 is an outstanding DVD player for the ideal home theater system, bringing DVD movies to life with stunning digital video and surround sound capabilities. 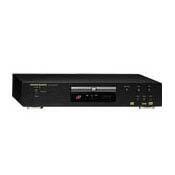 The DV4200 not only lets you enjoy DVD Video but is also compatible with CD-R, CD-RW and music playback from a single MP3-encoded CD disc, which delivers up to 10 hours of continues music. The Marantz heritage in building CD players and DVD players, along with strict selection of parts, have been fully exploited to bring out an amazing sound and image quality. A dedicated remote control compliments the versatility of the DV4200. Hello everyone. I noticed that a lot ppl have reviewed this unit when I was only 10 years old lol. Now in 2017. After many many years. I finally discovered this dvd player. Or should I say CD player lol. I mean who uses dvd anymore these days? This CD was bought simply to play CDs and to complete my vintage audio system and to match my Marantz 70s receiver. I bought this for a a whopping $10!! After seeing how ppl in early 2000s paid over 500$ CND is simply absurd . But then again it is 2017 lol. I'm happy with this purchase and that I have a dvd cd player that costed over $1000 in Canadian dollars! I will enjoy this one for a long time along with my vinyl records setup. Building year--> haven't opened it yet, since i bought it today from a staple with another 100 of ther the same units. , and a lot of drawmer gear. and dbx dsp units(no not the cheap ones like the pa+), but i knew this one had a nice dsp unit and i have my denon dn3900 cd-player or more scratch unit and offcourse a cambridge cd-player, i had thrown away my old dvd player 5.1 system a while ago, after removing the coolblocks and a nice large transformer. But a dvd player can be handy and i just refurbished a teac amp from the eighties for tv use and turntable ( acoustic classic wood with the arm upgraded), so nothing real special, only the annoying nonbalanced , non rca input on the klipsch speakers( second hand) and teac is a bit of a problem with studio and djgear and desktop audiocards, but i've tried it on a studio monitor and just fast on my tv and it sounded real nice for a dvd and the image was oke, but it offcourse needs to be cleaned and rewired and those basic cheap connectors, need to be replaced, but one thing at a time since the teac lies open, waiting for some components, and the same counts for the speakers with those annoying passive crossovers and not too expensive buildquality..... It's fun to see that the dsp from burrbrown in the old cd/dvd player still is made, made for mid till high quality sound and with the service manual , it's quite easy to repair. Music reproduction is fantastic. I don't use it for playing DVD's. Remote control works great. LCD display is not bright enough and hard to see from any distance. Hard to tell which track it's playing even from 10' away. I purchased this preowned in 2007 as a 2nd CD player to my Rotel RCD-1072. I like to have two CD players and alternate between them depending on the type of music being played It also gives me a reference as to just how good my Rotel unit is. But this DV4200 never ceases to amaze ame as to its musicality, detail, bass ext, soundstage, etc. As a number of reviewers said, this unit plays music better than some dedicated CD players of the same vintage and original price range. I don't use it for video. I have a new Marantz DVD player for that with HDMI output. This is the best dvd player in it's price range. The video quality is crisp and clear. The colours are bright and come out great. The sound is great. Not to mention it is one of the best physical looking players out there, slim yet expensive looking. Only thing I wish this DVD player had was a 6 channel output, but that option would increase the price by a few hundred. Good picture. Very good sound. Region-free through remote hack. MP3`s sounds good, no problems with CD-R/RW. Fast. Sometimes hangs after long-term use. Might have something to do with flushing of memory, perhaps? Just want to add a small thing here. This DVD-player CAN actually play SVCD/VCD with a hack through the remote. Excellent picture and sound quality. MP3's do sound better through it. Button layout is good. For those complaining about poor MP3 file management, i don't even use it with a tv for the majority of the time, i simply make a cd with mp3's on it, no folders and it works great. If you do it any other way then expect problems because it's a dvd player, not a dedicated mp3 unit. This product is a must have if you value music reproduction (in a HT environment). Of all the DVD players I've seen, this one has the best sound (at this price range). Generally, however, single disc CD players will give you better quality (if you are a purist). This unit beats low price cd changers in terms of sound quality though. For movies, it had excellent picture (though generally, the Denon DVD-800 seemed better). Has a nice OSD for setup and mp3 usage. For the price, this unit is as good as it gets all round for HT and music. Yamaha CD changers, Denon DVD-800, Cambridge Audio D500, Marantz CD changer.